To eliminate the need for open surgical implantation, researchers from the Massachusetts Institute of Technology (MIT) have developed a new injectable nanogel. The drug delivery material is composed of nanoparticles embedded in long polymer chains, a composite that is so moldable it can pass through a syringe and self-heal inside the body. After reforming in the body, the nanogel can control the release of multiple drugs, which could be used to treat macular degeneration or even cancer. Hydrogels are versatile materials and have found application in a variety of biomedical devices. Their mechanical properties can be extremely robust, and their hydrophilic properties allow them to interact extremely well inside the body. Usually hydrogels are highly cross-linked with strong chemical bonds between their polymer backbones, which prevent the hydrogels from changing shape once they are formed. Until recently, most hydrogels required a surgical procedure to be placed in the body, similar to other implantable materials. To help avoid these types of surgeries, a team from MIT has developed a new type of injectable nanogel, according to a recent story from MIT News. The new material uses a type of chemical bonding that is different than traditional hydrogels — it is weak enough to separate under shear conditions, like when it is passed through a syringe. Once injected, however, the bonds reform, self-healing the material inside the body. This performance was achieved with very simple components and materials, in contrast to other injectable hydrogels. 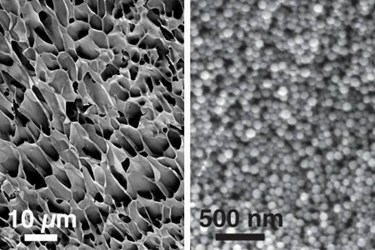 The new nanogel uses polyethylene glycol, poly-L-lactide (PEG-PLA) nanoparticles embedded in a cellulose hydrogel. This combination results in a hierarchical structure, according to a recent article published by the MIT team in Nature communications. Because of this hierarchical combination of materials, the nanogel can deliver both hydrophobic and hydrophilic drugs. By entrapping one drug in the cellulose hydrogel and another in the nanoparticles, differential release profiles can be achieved for very different drug types. Applications are wide ranging for such a versatile drug delivery system. Chemotherapeutic agents are often hydrophobic, which makes them suitable for placement in the nanoparticles, while proteins, antibodies, or growth factors could be delivered in the hydrophilic cellulose material, according to the MIT News article. The self-healing aspect of the nanogel allows it to remain in one place, which enables a local delivery of medication with reduced systemic side effects. One scenario the team has entertained is the use of the nanogel for a residual cancer treatment after the main tumor has been removed. Any remaining cells could be treated and destroyed. Macular degeneration is another potential application area, if the nanogel was designed to deliver anti-angiogenic drugs. Currently, injections are delivered into the eye on a monthly basis, but this frequency could potentially be reduced with the new nanogel. While injectable nanogels hold much promise as a drug delivery material, other materials are being examined for injectable applications. For example, 3D injectable scaffolds were recently designed by Harvard University researchers to induce a targeted immunotherapy response that could be directed toward tumors.